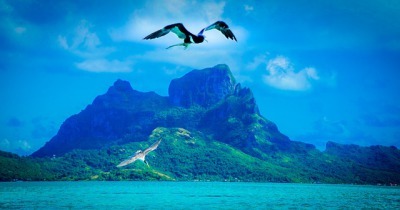 In a sea of gems and diamonds, Bora Bora is the real heart of the ocean. With nothing to stare out the window during the flight but dark blue water and minuscule white lines that made up waves in the Pacific, I was not paying too much attention to my view. When I did, however, take a peek, I noticed that it had started to change. I could start to see little dots of aqua here and there that made up small lands. 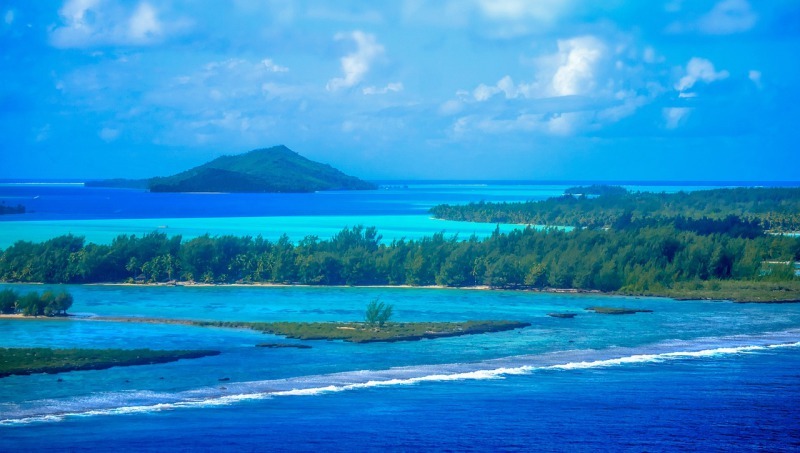 Stunningly beautiful, the islands were surrounded by circles of coral reef; and I began to wonder why I was going to Bora Bora, when the islands below seemed so inviting. The answer to my mental soliloquy appeared in the distance. 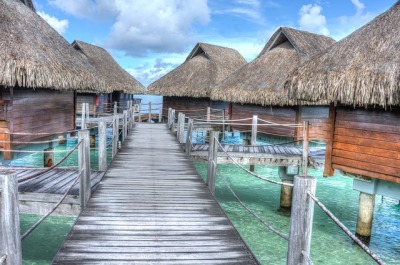 Bathed in sunlight and standing magnificently in the sparkling pacific, was Bora Bora. The island at its center had a craggy, lush mountain dressed in the finest cloak of emerald green which fanned out at the base in a long train of palm and tropical jungle. It was trimmed in white sand around the edges that dipped into clear deep blue waters, bordered by the brightest, clearest blue you could ever imagine. In a sea of gems and diamonds, Bora Bora is the real heart of the ocean. I landed on a thin stretch of runway, on one the smaller surrounding islands and even Moto Mute airport could have been a location for a 5 star resort. I took a boat out to the Intercontinental Bora Bora Le Moana Resort. One of the most beautiful places I have ever stayed at and definitely the most expensive. I was greeted with a Pina Colada on arrival at the reception and afterwards was guided to my room. The bungalow I was staying in was on stilts over a lagoon and from the white sand beach, you have to cross a boardwalk lined with hundreds of hot pink flowers over crystal clear water which contrasted beautifully with the surrounding blue. The bungalow I was staying in had a ladder with a jetty floating serenely in the water. Inside was an immaculate wooden bathroom, a bed with pure white linen, flowers and a mosquito net. There was also a small settee with a glass coffee table which looked down into the water. You could take the top of the glass off and feed the fishes from inside your own room. I spent days snorkeling in the tranquil tropical waters and diving with sea turtles, black tipped reef sharks, angel fish, bright orange clown fish and dolphins. Bigger fish patrolled the drop offs on the reef covered in corals and sea anemones. At night after eating buffet’s of seafood made up of crabs, shellfish, ceviche and game fish, I would take the glass bottom boat back to the intercontinental and the milky way would be bright in the sky. The water was bioluminescent from phytoplankton, which got disturbed by the boat. It created a beautiful otherworldly light and I felt like I was enveloped in stars. My most treasured marine experience happened when I went out to swim with sting rays. I never imagined these creatures could be so endearing and the fear I had before I jumped in the water with them was immediately dispelled, they all joyful flapped and hugged you and were so cute. I could have swum with them forever. I was also eager to head to the air again and went out parasailing, which is an unrivalled way to see the island in all its brilliance. The boat built up speed and as the line was let out I took to the sky. The air I was flying through was rich with the smell of coconuts, salt and flowers. I could see larger animals swimming as black dots in the azure below and out at the Pacific I could see its waves crash pearly white against the reef that circled around the aqua blue. Back at the hotel I spent the late evening drinking Pina Coladas watching the sky turn from a spectacular blue to purple, pink, yellow, orange and red. The water that calmly lapped against the beach reflected the rainbow of colors from the sky. Speaking of rainbows when the tropical rain rolled in with clouds shaded in a dark grey, the water below became even more vivid as the teals, turquoise and sapphires contrasted superbly with the sky. As the warm tropical rain fell the island was gifted with many arching rainbows, which reminded one of Peter Pan and Never, Neverland. How could I ever leave this glorious place of beauty, history, wildlife, color and culture.